This step will be skipped if your payment schedule is turned off. Go back to the PCS Dashboard. Your claim will be highlighted in orange if it’s on the assessment stage. 1. 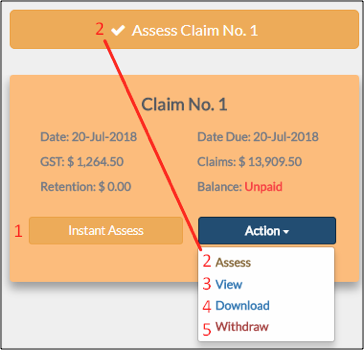 Click Instant Assess to confirm the claim and if there are no changes to be done. Note that you cannot make your next claim unless you have already assessed your current claim. 2. Click Assess if you want to review and apply changes to your claim. It’s the same as Update Assess in the old Payment Claim System. 3. Click View to display your document. 4. Click Download to save it to your computer. 5. Click Withdraw to withdraw the claim. Withdrawing the claim also withdraws the registered payment (if there's any). Note that you can only withdraw the current claim. 6. Once assessed, click Export Tax Invoice located at the bottom right corner of the portal to download the document for payment schedule.